A woman has been arrested on suspicion of arson with intent to endanger life after a ground-floor flat was almost completely destroyed in a large fire. Fire crews were called to the property on Richmond Drive in Leigh shortly after midnight on Monday. Greater Manchester Police (GMP) were called to the scene at 12.23am and a 23-year-old woman was arrested. She remained in custody for questioning on Tuesday morning. Firefighters wearing breathing apparatus tackled the flames which totally gutted both the living room and kitchen, leaving the flat uninhabitable. The other occupants of the block had to evacuate their properties and were only allowed back into their homes at around 1.30am, after more than an hour outside. Crews were there for around two hours in total. 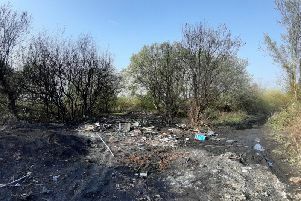 The police and fire service are conducting a joint investigation into the cause of the blaze and inquiries are ongoing.